“That first park was legit!” exclaims Lowery Cruthers (Jake Johnson), a staffer at the new Jurassic World amusement park. “It didn’t need genetic hybrids, it was real.” Cruthers wears a classic Jurassic Park T-shirt he purchased on eBay for $150—apparently mint condition ones go for upwards of $300. Jurassic World is the title of the latest Jurassic sequel and the culmination of the late John Hammond’s dream of a dino theme park on the fictitious Isla Nublar near Costa Rica. The film, a big-budget, mass-marketed action summer sequel that skewers our mass-marketed consumer culture, is steeped in intriguing self-awareness but never achieves the absolution it seeks. Hammond’s aborted park has merely been reclaimed and repackaged by a billionaire named Simon Masrani (Irrfan Khan) into Jurassic World, attracting 20,000 daily visitors to a milieu that’s part Disney’s Animal Kingdom, part SeaWorld. There’s a kids dino petting zoo, a SeaWorld-style aquatic show and translucent gyrospheres that allow visitors ride their way through the dinosaur herds. And the main street is a spine of consumer and corporate excess that attempts to both incorporate and relegate the film’s requisite product placement. But market surveys show a slight dip in consumer interest, prompting Masrani and his careerist park manager Claire Dearing (Bryce Dallas Howard) to goad geneticist Dr. Henry Wu (B.D. Wong) to develop a new hybrid dinosaur. “Customers want them bigger, louder, more teeth,” Dearing says, and so enters the Indominus rex—technically, “Verizon Wireless presents Indominus rex.” It’s a dinosaur … no, it’s a tree frog … no, well, it’s Cloverfield. And it’s intelligent and aggressive, meaning once it escapes its lunkheaded captors, it makes a beeline for the all-you-can-eat human buffet on the island’s south side. With the park’s minders paralyzed by financial oblivion and trying to recapture Indominus rex through nonlethal methods, it falls to Owen Grady (Chris Pratt) to save the day. Grady is pretty much Star-Lord as a velociraptor wrangler who has bred and convinced a quartet of raptors that he’s their alpha, mainly because he feeds them. His research piques the interest of InGen exec Vic Hoskins (Vincent D’Onofrio), who wants to requisition Grady’s raptor whispering and weaponize it. Naturally, Grady and Dearing dated once. And naturally Dearing’s nephews, Zach (Nick Robinson) and Ty (Gray Mitchell), finds themselves in peril. And naturally it all comes down to Dearing as a scream queen and Grady riding his Triumph Scrambler into battle alongside his raptor cavalry. 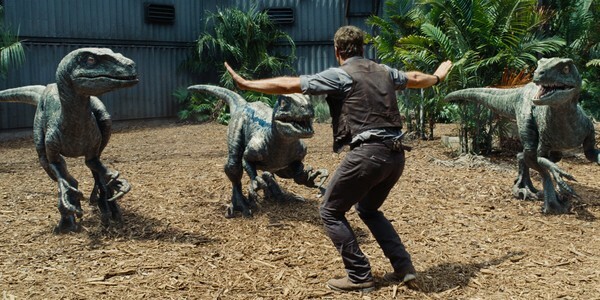 Jurassic World is an entertaining B-movie with A-movie flourishes. The human characters are mostly unconvincing and disposable. But director Colin Trevorrow respectfully references everything from Steven Spielberg's Jurassic originals to Jaws to Godzilla. A scene where a flock of Pterodactyls prey upon scampering park goers is straight out of Hitchcock's The Birds. The Indominus rex itself channels not only the dictates of fictional consumers, but also real-world moviegoers who want bigger and better for their ticket price—”bigger, louder, more teeth.” The hybrid dino may as well be a new Transformer, or the latest Chitauri warship, or the latest CGI incarnation of King Kong. If this is meant as a mea culpa, it still wouldn’t insulate Trevorrow and Jurassic World from being participants in this same system. But Trevorrow’s aim is more ironic than exculpatory. He’s in on the satire, and it’s why you have moments like Jimmy Fallon hosting the gyroscope’s tutorial video, or the ride’s young, bored operator intoning, “Enjoy the ride,” after each visitor boards, or Masrani flying his own chopper into battle against the raging rex. Most subversively, Trevorrow’s computer effects and soaring camera POV elicit a sense of wonder about Jurassic World the park, making it a place we’d still visit despite its checkered history, if it actually existed. Because regardless of whether the danger is real or imaginary, it better be entertaining.